This morning, as usual, I was feeling troubled about something that had happened when I reached into the basket underneath my stroller for a water bottle and noticed a small box of tissues floating among the baby-wipe-children’s-hat-magazine mess. 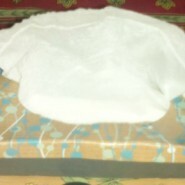 My heart jumped a little when I saw those tissues, like it had been shocked by a microscopic defibrillator. Less than one month ago an ICU nurse handed that very same box of tissues to my mom when my father was lying in the ICU on life support following a heart attack. 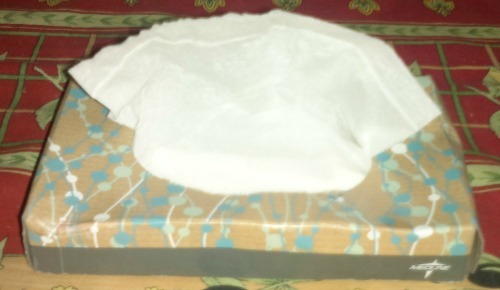 Over the next few days, my mom managed to use up half that pack of tissues. But, B”H, she never had a chance to finish them up. Today, my father is recovering post-surgery at an outpatient rehab center, and his expert doctors are expecting him to make slow but (IY”H!) steady progress towards a full recovery. My second-grader’s impossibly illegible handwriting which got cleared up by a few months of occupational and vision therapy. A dear friend’s struggle with severe mental health issues which lifted with the help of some medication and a lot of siata dishmaya. A local criminal who had been harassing my family for years who suddenly picked up and left the neighborhood right before Passover. And as I thought about my revolving door of tsures, I realized what a constant they are. It’s always something. If not this, then something else. 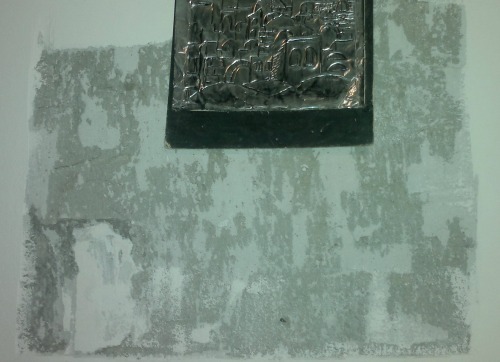 And then I looked up from the tissues to the unpainted square on our wall, in memory of the Temple’s destruction. And it suddenly occurred to me that this same square exists inside my heart as well. The lacks, the worries, the troubles which are as constant in my life as the beating of my heart and the pumping of my lungs. And that’s OK. This revolving door of tsures always has been and always will be. Because, as my teacher Dina Friedman pointed out, just like the ups and downs of a healthy heartbeat, the ups and downs of life mean that we are still alive. Wow so true. Beautiful, thank you. Now I need the box of tissues! That is so beautiful, Chana Jenny. So very beautiful. What a terrific piece of inspiration. May we never have to use up the whole box on Tzuris! Thank you for updating us on your father’s progress. May he continue to improve.The good news should overpower the bad news by 100 to 1. I love all the connections you made on this post- stroller, tissues, being in Jeruslem and remembering your parents in the States, and finally… the upcoming 3 Weeks and the square of pain that we carry in our hearts. Thanks Jenny!